Gosh, been so busy, nose down, working on a couple of show quilts, that I haven’t posted for a while. 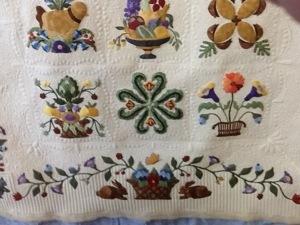 First, here’s a beautiful quilt appliquéd by Joyce. 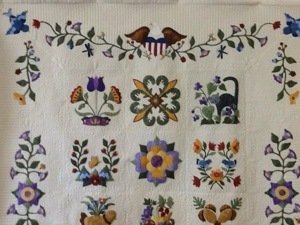 Some great appliqué and fun to quilt-even if it took me forever to figure out what I wanted to do. 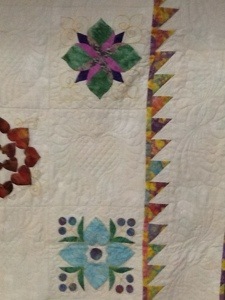 These quilts with very little quiltable room are tough but I like the result. 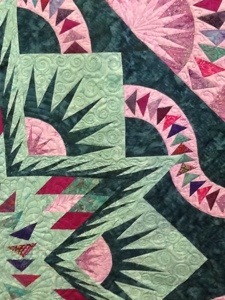 This is another show quilt you will probably recognize as Judy Niemeyer’s Glacier Star. 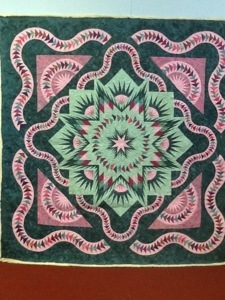 It is truly a challenge to quilt these paper pieced marvels since they are so popular. Charmaine’s version is delightful. I love the colors! 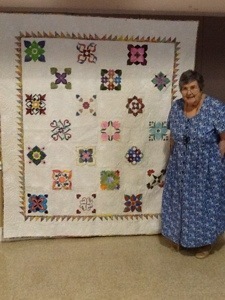 And, last but not least, a beautiful happy birthday quilt for my friend and “quilt-bee participant , Beck. Our Sugar Land, Texas bee makes a quilt for each member celebrating their 80th. 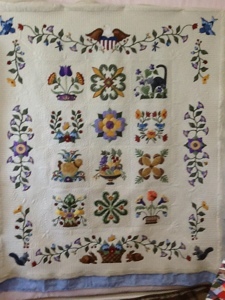 The other members do the terrific appliqué blocks. Now hint for today…if you mark with pencil and it won’t come off, mix 1/4 cup water with 3/4 cup alcohol and 7or 8 drops of Palmolive green liquid dish detergent and apply gently with toothbrush.